Using the same basic work car chassis, I also built a water tank car. It is intended to remain with the steam pump car. The pump is reversible, so it can either pump water from a nearby stream or pond into the tank car for later use, or it can pump water from the tank for use when no other source is available. I wrapped a strip of 0.020 scribed styrene siding around a 9/16" dowel. The size was arbitrary, it just looked about right on the car. I glued the two ends of the styrene together and held it with rubber bands until dry. 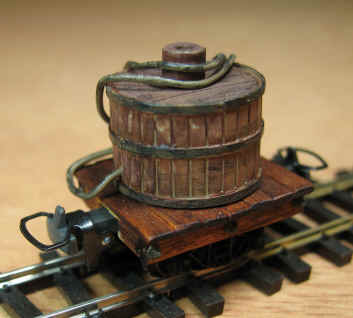 Then I wrapped three HO scale 1"x4" strips around the tank to form bands. It was very handy to wait to cut the internal dowel to the right length until the gluing was compete. I sawed the dowel to length, then scribed "boards" into the top surface. I used a piece of styrene tubing to form a filler cap, then painted and stained to get the look I wanted. The hose is a length of electronic solder, which is available in various small diameters and can easily be bent to the desired shape and takes paint well. Figures 1 and 2 show the competed car. 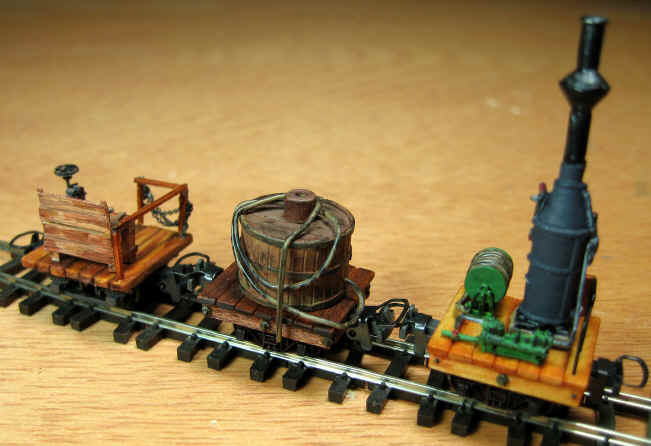 This car is fitted with Bemo couplers because it is going to a friend in Germany along with the workbench car and steam pump car pictured in Figure 3. 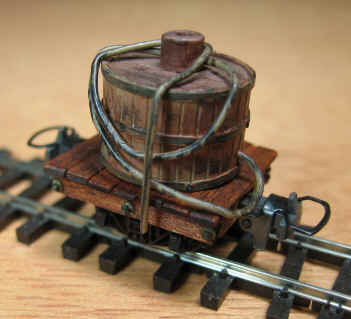 That's a Woodland Scenics boiler on the pump car.